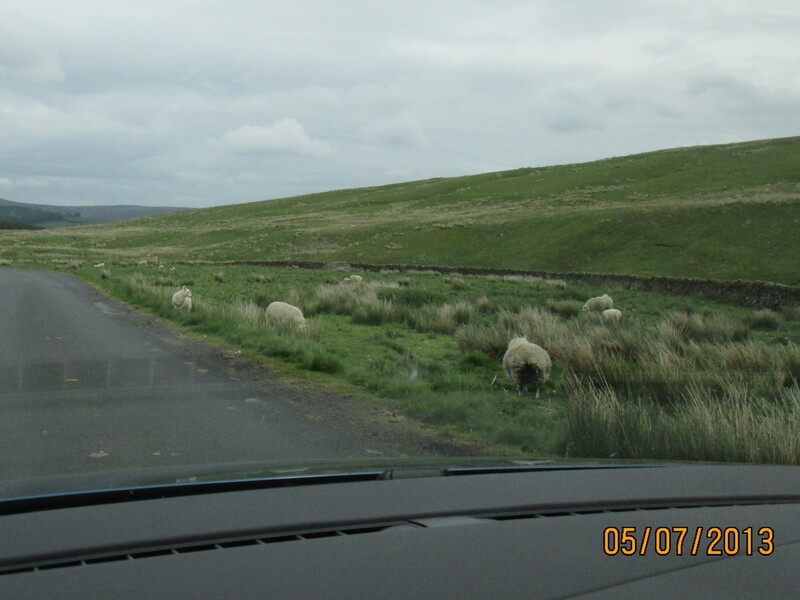 Today I went with Fiona to Hawirk, (pronounced Hoyk), Scotland which required us to drive through about 30 miles of scenic, green rolling hills of various shades and textures and free-roaming sheep that have been newly shorn walking leisurely along the road; causing drivers to slow, sometimes come to a complete stop, until they mosey along into their pastures. Of course we started our day in Hawirk/Hoyk at the “Pickled Orange” cafe which boasts ” Great Food, Great Coffee” on the business card. 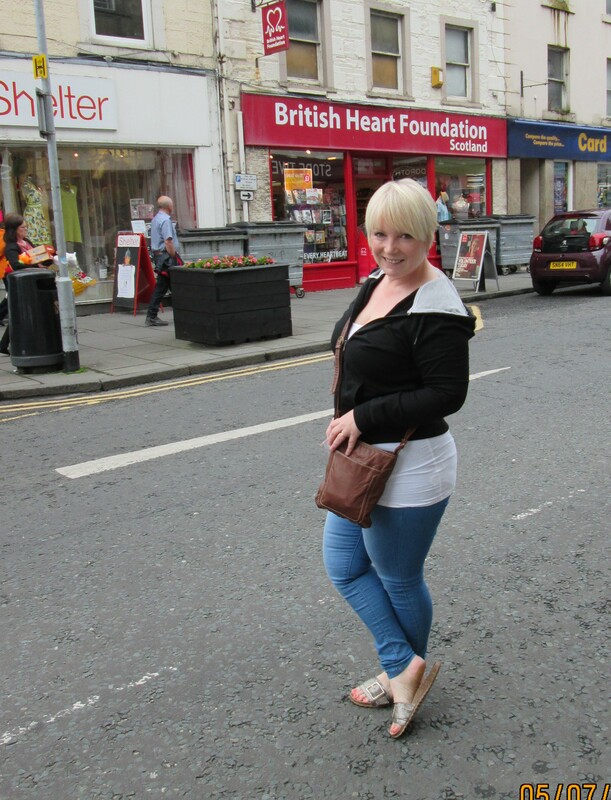 No lying, the coffee is great and is served with real, thick, sweet Scottish double thick cream. Did I mention that it was sweet and thick? Accompanied by a fruit filled, fresh from the oven, homemade scone with a side a sweet butter that was room temperature making it very easy to slather onto the scone halves. Are you drooling yet? I was! Our day in Hawirk/Hoyk was primarily dedicated to finding the perfect birthday gift for Fiona’s friend’s 50th which, of course, involved wine. Lots of looking, examining, evaluating, discussing and in the end making a purchase not only for the gift; but an outfit as well. 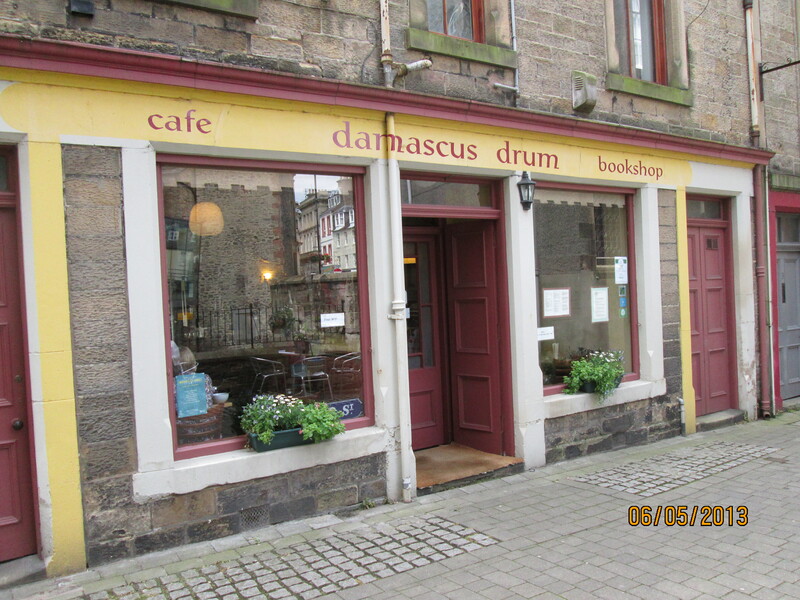 Now it’s time for tea and Fiona takes me to a darling cafe and bookstore in a narrow side-street called Damascus Drum Cafe and Bookstore. This is a book readers dream. Old brown leather couch to sink down into while you sip your beverage of choice and immerse yourself in literature. There were books, books, and books. I would have liked to take some home (books are for sale); but since I will be flying to Belfast on Sept 7th, and there is a smaller weight limit on Jet Blue, I could only wish. And I still have 9 books I’ve not opened yet. Since many of you are readers of books I want to share my recent reads and ask you to share yours as well. Number One on my list is by Phillipa Gregory who is a meticulous historical fiction writer and author of “The King’s Curse” which spans 40 years of the reign of Henry the VIII. If you like this then read “The Other Boleyn Girl” and/or “The White Queen”; all of these are most appropriate for me, being in Great Britain, now. 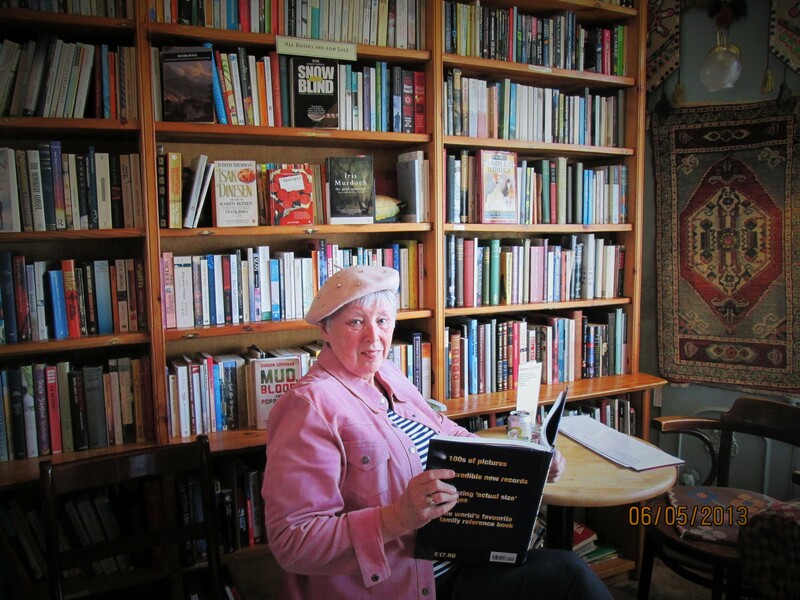 Maeve Binchey, an Irish female author has an uncanny ability to weave her characters through most all of her books in a way that you feel like you know them; and, she gives descriptions of foods in Dublin that make you think you could just go down the street and get some. Most recently I read “The Copper Beech” which chronicles 2 generations of families in a small Irish town with one small schoolhouse and a Copper Beech tree into which every student has carved their initials. I would suggest you start with”Scarlet Feather,” then “Tara Road,” moving onto “Quentins” followed by “Evening Class” and then “Nights of Rain and Stars”. Elizabeth Robinson is a first time writer who gave us “The True and Outstanding Adventures of the Hunt Sisters”. Since I was an only child, my view of this hilarious book may be different for those who grew up with siblings. If you have read “The Shack”, and I don’t know many who have not read it; follow this up with “Cross Roads”. I’ve just started this one, but it is holding my attention. Still to go are Garrison Keillor’s “Pontoon”; “A Map of the World” by Jane Hamilton, “The Things I Know Best” by Lynne Hinton and “Rules For a Perfect Life” by Niamh Greene who also wrote “Secret Diary of a Demented Housewife”, plus a few others. If you have read any of these give me your review! 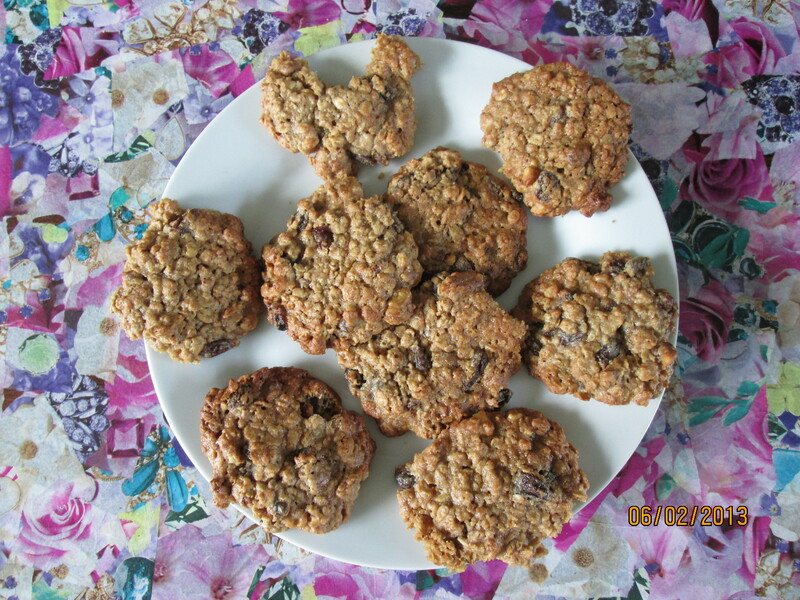 PS: I have fresh oatmeal cookies with raisins and toasted walnuts to enjoy with my books….. I would have had more, but Megan ate some.